The New Brunswick Innova 2000 Orbital Benchtop Shaker is designed with operator safety in mind and is a great addition to any lab. The Innova 2000 handles up to 6 Liter flasks in either continuous duty shaking of lab glassware or timed sessions up to 99 hours. This orbital benchtop shaker is built for longterm, rugged use and is one of the quietest models on the market thanks to a triple action Gyratory drive. This laboratory shaker is ideal for every-day lab applications including mixing, agitation, and shaking incubation, with a built in acceleration circuit that prevents sudden starts and stops, minimizing splashes. To prevent damage in the event of a spill all electronics are sealed off. The New Brunswick Innova 2000 Orbital Benchtop Shaker has a low profile design that makes it an ideal choice for use in environmental chambers, as well as cold rooms, incubators, warm rooms, or everyday ambient environments. This laboratory shaker is easy to program from the microprocessor controlled touch keypad and speed controller with displayed increments of 1. Agitation speed range is 25 – 500 RPM and works great on a variety of cell culture applications. 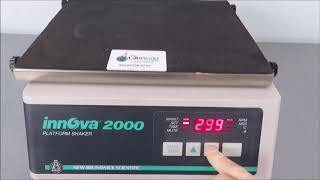 This New Brunswick Innova 2000 works great an ideal for every-day lab applications. This machine has been tested to meet the manufacturer factory specification. All of our lab equipment comes backed with our standard warranty. Should you have any questions, please don't hesitate to contact us.